One of the warnings on this product should be 'cuteness overload,' because this little LED is too adorable for words. 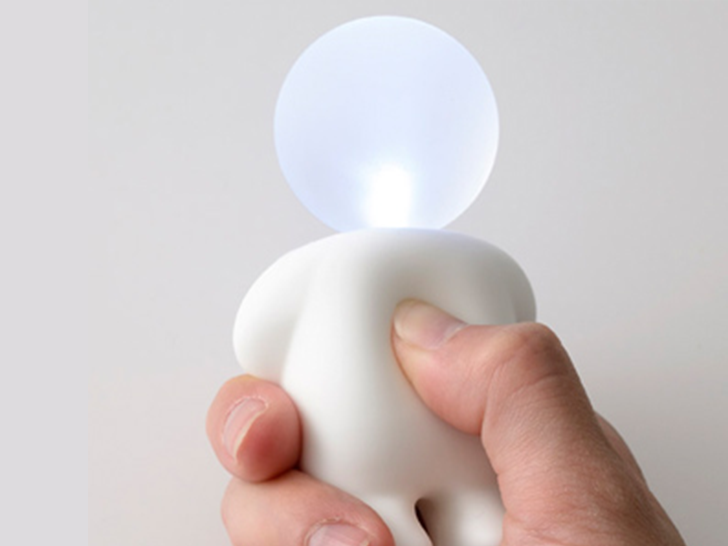 Japanese designer Kasahara Eriko designed the Lumibaby as a portable LED that turns into a night-light or flashlight with just a press to the tummy. Designed as a “light that brightens the space and your mind” Lumibaby is truly meant to bring joy to its users. Its charming Pillsbury Doughboy-esque design illuminates in a snap with just a quick press to its silicone tummy. It even dims when you press and hold! The mini-LED provides just enough light to navigate in the dark as flashlight or a stationary night-light. Designer Kasahara Eriko developed the design as a trusty companion at one’s bedside, entrances, in dark corridors, and even when you go out. The LED has a running time of about 8 continuous hours. Designed as a "light that brightens the space and your mind" Lumibaby is truly meant to bring joy to its users. Its charming Pillsbury Doughboy-esque design illuminates in a snap with just a quick press to its silicone tummy. The mini-LED provides just enough light to navigate in the dark as flashlight or a stationary night-light. Designer Kasahara Eriko developed the design as a trusty companion at one's bedside, entrances, in dark corridors, and even when you go out. The LED has a running time of about 8 continuous hours. It even dims when you press and hold!